Fresh off a visit to the newish AAA Restaurant in Richmond, it was evident that their pineapple bun does indeed give Lido Restaurant a run for its money. Both are excellent and in fact, very similar. There is a reason for that though. The pastry chef at AAA used to work at Lido and the original recipe is being used at AAA. With that being said, I'm convinced that they are not exactly alike though. To confirm this suspicion, I enlisted the help of Tina (who can out eat me!) 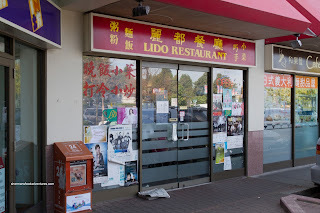 in a visit to Lido Restaurant. 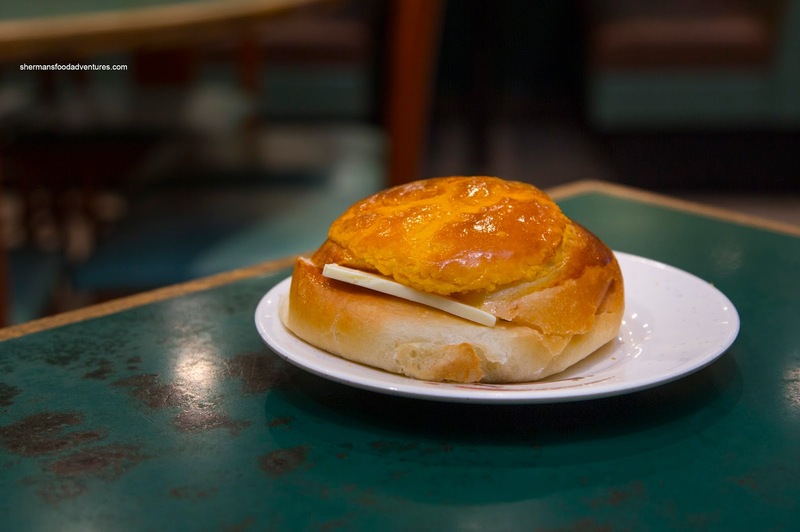 So right off the bat, we went for the comparison with a couple orders of the Bo Loh Yau (Cantonese for Pineapple Bun with butter), even though I had plenty of food coming. Just by appearance alone, the topping on the bun at Lido was smaller and slightly thinner, yet equally sweet and crispy. Texturally, it was tad softer, but that could've been that it was more warm too. In general, they are both good and very similar. As to which one I prefer, I'm going to disappoint you by saying that both are excellent and I would not have a problem with either. Not a definitive answer, but it is really that close. 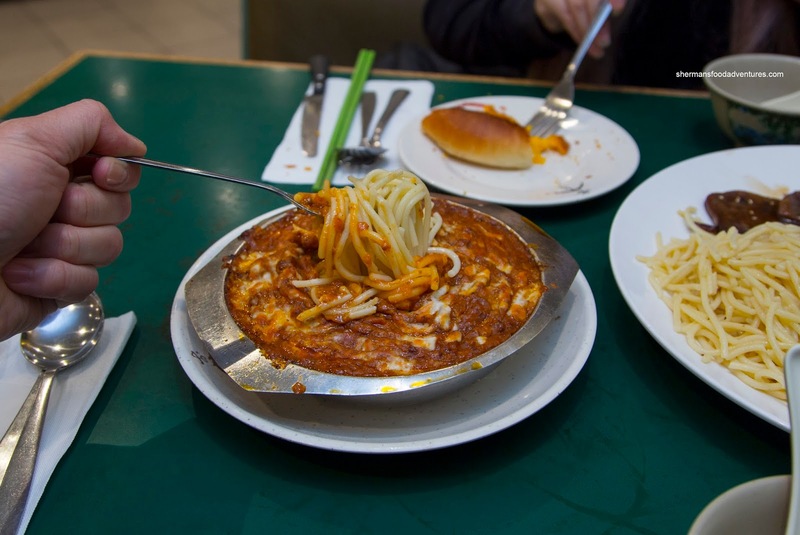 We didn't get out of there by just eating Bo Lo Yau, so we got 2 HK-style cafe classics in the Baked Spaghetti Bolognese and Baked Pork Chop Rice. Although the spaghetti was overcooked and bordering on too soft, the meat sauce on top made up for it. 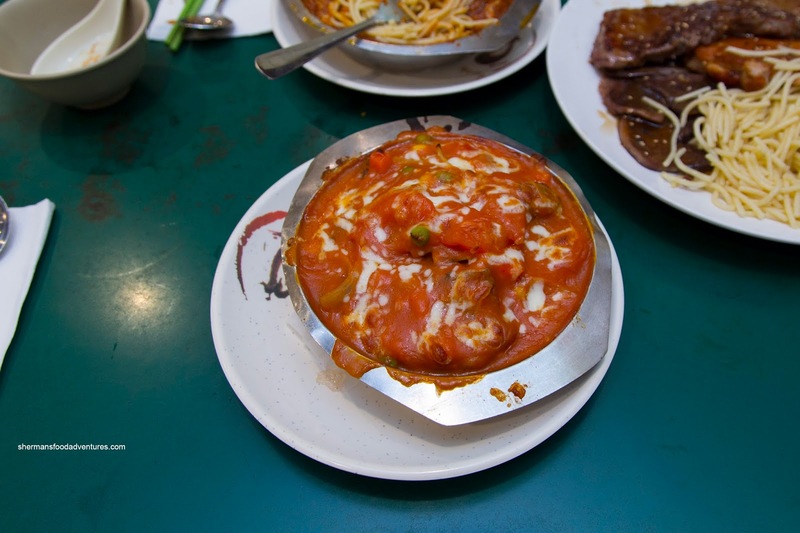 It was filled with tender nuggets of beef bathed in a flavourful and thick sauce. The flavours were balanced with the sweetness being restrained. As for the pork chop rice, the rice itself was also on the softer side. Again, the tomato sauce came to the rescue being the right viscosity and having a noticeable, yet not overwhelming tang. It was sweet enough, without being too much so. The piece of pork chop was cut into pretty big pieces being tender and cooked just right. Looking at the menu, we decided to try their Pork Spareribs Hot Pot Rice (that required 30 mins to prepare). Since they cooked it the traditional way right in the clay pot, there was a rice crust that was nutty and not burnt. However, the rest of the rice could've been even drier. On top, the pieces of sparerib were meaty and tender. 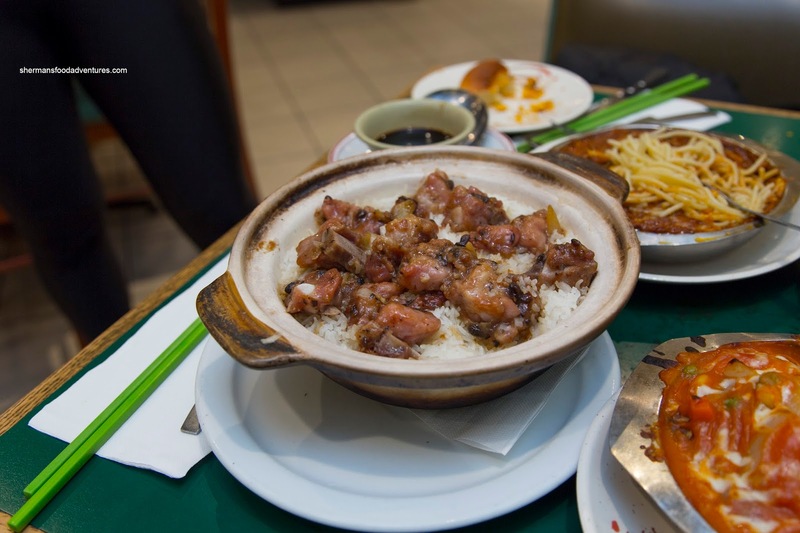 They were well-seasoned and helped flavour the rice with a garlicky and soy saltiness. 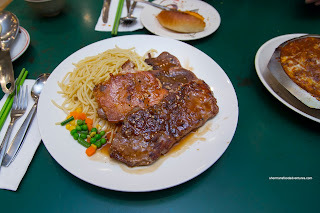 Lastly, we got the 3-Item Meal consisting of Japanese-Style Sirloin, Japanese-Style Ox-Tail and Chicken Steak atop spaghetti and served with soup. I guess the teriyaki-type sauce made this Japanese? Whatever the case, the sirloin was super tender and nicely glazed. The same could be said about the juicy chicken steak with rendered and crispy skin. The ox-tail was sliced a bit too thin for our liking though. Ultimately, the food we ate at AAA and Lido was decent, but it was all about the pineapple buns. You really can't go wrong with either, so visit the one with a shorter lineup. After reading your post on AAA, I went there today to try the pineapple bun, but alas, they're closed for a week. Holiday? Sign was in chinese. Anyways, opted for second choice Lido, and got a bun to go. I haven't had one for awhile, but it was pretty tasty with the half/half tea. Looking forward to trying AAA when they're back. 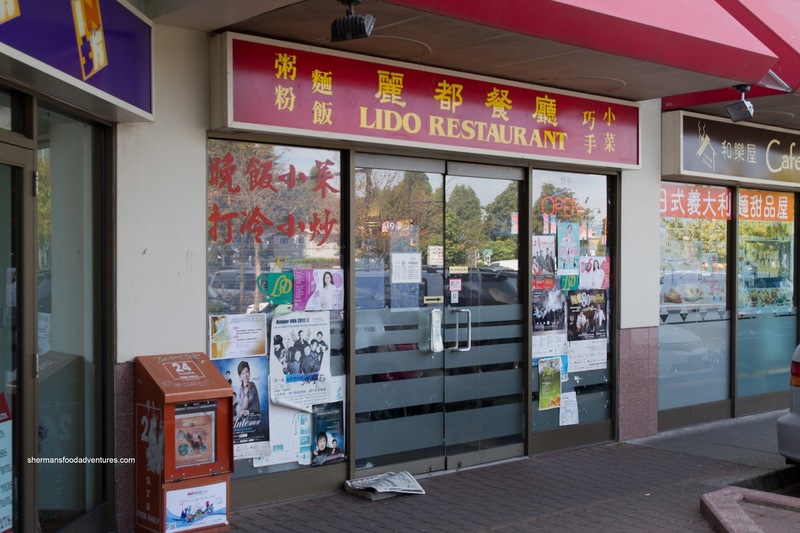 I always find the service at Lido pretty stoic, at best. Pineapple bun OD?